The 2016 United States elections were held on Tuesday, November 8, 2016. During this presidential election year, the President of the United States and Vice President were elected. In addition, elections were held for all 435 voting-member seats in the United States House of Representatives (as well as all six non-voting delegate seats) and 34 of the 100 seats in the United States Senate to determine the 115th Congress. Presidential election results map. Red denotes states won by Trump/Pence, blue denotes states won by Clinton/Kaine. 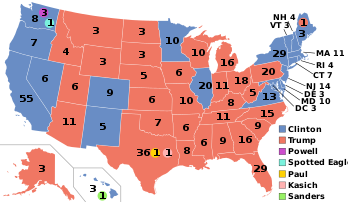 Numbers indicate electoral votes allotted to the winner of each state. Seven faithless electors cast votes for various individuals. The Republican Party won the presidency, and retained its majorities in the House and Senate although the Democrats made modest gains in both houses. Twelve state governorships, two territorial governorships, and numerous other state and local elections were also contested. The United States presidential election of 2016 was the 58th quadrennial presidential election. The electoral vote distribution was determined by the 2010 census from which presidential electors electing the President and Vice President were chosen; a simple majority (270) of the 538 electoral votes were required to win. 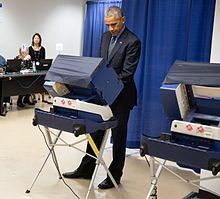 Former President Barack Obama, a member of the Democratic Party, was ineligible to be elected to a third term due to term limits established by the Twenty-second Amendment to the United States Constitution. Businessman and reality television personality Donald Trump of New York won the Republican Party's presidential nomination on July 19, 2016, after defeating Texas Senator Ted Cruz, Ohio Governor John Kasich, Florida Senator Marco Rubio, and several other candidates in the Republican primary elections. Former Secretary of State, First Lady and New York Senator Hillary Clinton won the Democratic Party's presidential nomination on July 26, 2016, after defeating Vermont Senator Bernie Sanders and others in the Democratic primary elections. This was the first election with a female presidential nominee from a major political party, as well as the first election since 1944 that had major party presidential nominees from the same home state. Clinton won the popular vote, taking 48% of the vote compared to Trump's 46% of the vote, but Trump won the electoral vote and thus the presidency. Libertarian Gary Johnson won 3.3% of the popular vote, the strongest performance by a third party presidential nominee since the 1996 election. Trump won the states of Michigan, Pennsylvania, Wisconsin, Florida, Ohio, and Iowa, all of which were won by Obama in 2008 and 2012. The election is one of five presidential elections in American history in which the winner of the popular vote did not win the presidency. The United States government's intelligence agencies concluded the Russian government interfered in the 2016 United States elections. A joint US intelligence review stated with high confidence that, "Russian President Vladimir Putin ordered an influence campaign in 2016 aimed at the US presidential election. Russia’s goals were to undermine public faith in the US democratic process. All seats in Senate Class 3 were up for election. Democrats won a net gain of two seats, but Republicans retained a majority with 52 seats in the 100-member chamber. All 435 voting seats in the United States House of Representatives were up for election. Additionally, elections were held to select the Delegate for the District of Columbia as well as the delegates from U.S. territories. This includes the Resident Commissioner of Puerto Rico, who serves a four-year term. Democrats won a net gain of six seats, but Republicans held a 241-to-194 majority following the elections. Regular elections were held for the governorships of 11 U.S. states and two U.S. territories. Additionally, a special election was held in Oregon after the resignation of John Kitzhaber as Governor. Republicans won a net gain of two seats. In 2016, 44 states held state legislative elections; 86 of the 99 chambers were up for election. Only six states did not hold state legislative elections: Louisiana, Mississippi, New Jersey, Virginia, Alabama, and Maryland. Many states also held elections for other elected offices, such as attorney general. Many states held ballot measures. Bakersfield, California: Incumbent Harvey Hall did not seek re-election. Karen Goh was elected to succeed Hall. The office is not partisan. Baltimore, Maryland: Incumbent Democrat Stephanie Rawlings-Blake did not seek re-election. Democrat Catherine E. Pugh was elected as Rawlings-Blake's replacement. Gilbert, Arizona: Incumbent John Lewis resigned prior to the election. Interim Mayor Jenn Daniels was elected to succeed Lewis. The office is not partisan. Honolulu, Hawaii: Incumbent Democrat Kirk Caldwell won re-election to a second term. Milwaukee, Wisconsin: Incumbent Tom Barrett was re-elected to a fourth term. The office is not partisan. Portland, Oregon: Incumbent Charlie Hales did not seek re-election. Ted Wheeler was elected to succeed Hales. The office is not partisan. Richmond, Virginia: Incumbent Dwight C. Jones was term-limited and cannot seek re-election. Levar Stoney was elected as the new Richmond, VA, mayor. The office is not partisan. Sacramento, California: Incumbent Democrat Kevin Johnson did not seek re-election. Democrat Darrell Steinberg was elected as Johnson's replacement. San Diego, California: Incumbent Kevin Faulconer won a second term as mayor. The office is not partisan. Tulsa, Oklahoma: Incumbent Republican Dewey F. Bartlett Jr. was defeated by city councilor and fellow Republican G. T. Bynum. This table shows the partisan results of Congressional, gubernatorial, presidential, and state legislative races held in each state and territory in 2016. Note that not all states and territories hold gubernatorial, state legislative, and United States Senate elections in 2016; additionally, the territories do not have electoral votes in American presidential elections, and neither Washington, D.C. nor the territories elect members of the United States Senate. Washington, D.C. and the five inhabited territories each elect one non-voting member of the United States House of Representatives. Nebraska's unicameral legislature and the governorship and legislature of American Samoa are officially non-partisan. In the table, offices/legislatures that are not up for election in 2016 are already filled in for the "after 2016 elections" section, although vacancies or party switching could potentially lead to a flip in partisan control. ^ a b One of Maine's Senators is a Republican, the other (Angus King) is an independent who has caucused with the Democrats since taking office in 2013. ^ a b In New York and Washington, Democrats control the House and a coalition of Republicans and Democrats control the Senate. ^ a b One of Vermont's Senators is a Democrat, the other (Bernie Sanders) was elected as an independent but has caucused with the Democrats since taking office in 2007. ^ a b Including two Independents who caucus with the Democrats. ^ a b Washington, D.C. does not elect a governor, but it does elect a mayor. ^ Although elections for governor of American Samoa are non-partisan, Governor Lolo Matalasi Moliga was an Independent when first elected governor in 2014. ^ With the 2016 election, Governor Lolo Matalasi Moliga affiliated himself with the Democratic Party at the national level. ^ Governor Alejandro García Padilla is a member of the Popular Democratic Party, but also affiliates with the Democratic Party at the national level. ^ Resident Commissioner Pedro Pierluisi is member of the New Progressive Party, but he has caucused with the Democrats since taking office in 2009. ^ Governor Ricardo Rosselló is a member of the New Progressive Party, but also affiliates with the Democratic Party at the national level. ^ Resident Commissioner Jenniffer González is member of the New Progressive Party, but he has caucused with the Republicans since taking office in 2017. ^ Miller, Greg; Entous, Adam. "Declassified report says Putin 'ordered' effort to undermine faith in U.S. election and help Trump". Washington Post. ^ "Statistics of the Presidential and Congressional Election of November 8, 2016". U.S. House of Reps, Office of the Clerk. Retrieved April 10, 2017. ^ Warnock, Kae (March 11, 2016). "2016 Legislative Races by State and Legislative Chamber". National Conference of State Legislatures. Retrieved May 17, 2016. ^ "2016 Presidential Election". The American Presidency Project. Retrieved April 10, 2017. ^ Mayer, Steven. "Karen Goh installed as mayor of Bakersfield". The Bakersfield Californian. Retrieved January 17, 2017. ^ "Baltimore Mayor Rawlings-Blake says she won't seek re-election". Fox News. Retrieved September 14, 2015. ^ Gossie, Michael (July 15, 2017). "Most Influential Women: Jenn Daniels, Town of Gilbert". AZ Big Media. Retrieved January 17, 2018. ^ Theen, Andrew (October 26, 2015). "Portland Mayor Charlie Hales withdraws re-election bid". OregonLive. Retrieved December 27, 2015. ^ "Mayor Kevin Johnson won't seek re-election". Sacramento Bee. Retrieved April 18, 2017. ^ "Steinberg wins Sacramento mayor's race by wide margin". Sacramento Bee. Retrieved April 18, 2017. ^ "GT Bynum Defeats Incumbent Bartlett For Tulsa Mayor". NewsOn6.com. June 28, 2016. Retrieved January 17, 2018. ^ "2016 State and Legislative Partisan Composition" (PDF). National Conference of State Legislatures. Retrieved May 17, 2016. ^ "State & Legislative Partisan Composition (2016 Election)" (PDF). National Conference of State Legislatures. Retrieved January 4, 2016.